Add a 10-15 second video introduction to your website, promote an event or give a holiday shout-out to your customers. Set your business up for success with professional video advertisements. Our vast library of stock footage means you don't even need to get in front of the camera. Free previews are always included. type ​of business. Let us inspire you!!! ​Perfect for Retail Stores, Restaurants, Lawyers, Insurance Agents, Accountants, Real Estate Companies, Construction, Mechanics, Health Care, Wedding Industry, Sales Agencies, Professional Drivers, Childcare Workers, Makeup Artists and Landscaping companies to name a few! Our custom business ads can be used many times on your website, Facebook, YouTube, Twitter, Instagram, blogs, Google+ Page, online business listings and email campaigns. You can even post any of your videos again in the future to reach a new audience. These promotional advertisements will elevate your business to the highest level of professionalism for years to come! It's well worth it for such high quality marketing tools and a total score for your upgraded brand recognition. Add a video introduction to your website, blog and social media accounts. It’s now affordable to have your very own broadcast quality promo video for your business. ​Quantity discounts and other options available. 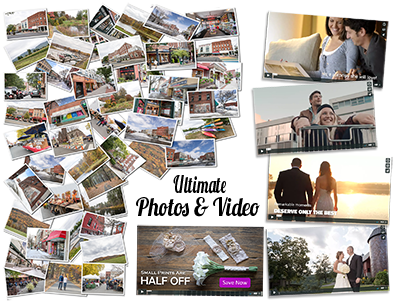 Receive 50+ professional images and a custom promo video filmed on location to update your website, create advertisements and to use as printed marketing materials. Receive 50+ professional images and 4 promo videos to update your website, create advertisements and to use as printed marketing materials. This package includes a short multi-camera video great for blog/website posts, press conferences, YouTube videos and online tutorials. It’s an easy way for you to add professional video content to your website and social media. Increase your online presence and take a step above your competition. Receive a generous collection of photos showcasing the beauty of our area. All images are available for unlimited use as blog posts, website headers and printed advertising. You will have enough material to keep your social media sites fresh for years. 300+ landscape photos of western MA town, cities and surrounding areas. 20+ bonus images from the city of your choice. Summer, fall, winter and spring photos included for seasonal advertisement needs. Need material for your company website? How about your Facebook page, Twitter posts, Instagram account, blogs, Google+ Page, online business listings and even you email campaigns? These photos will give you plenty of options while connecting with the people who live and work in our beloved western Massachusetts. Generate comments, reposts and create a buzz online with your business right in the middle of it all!